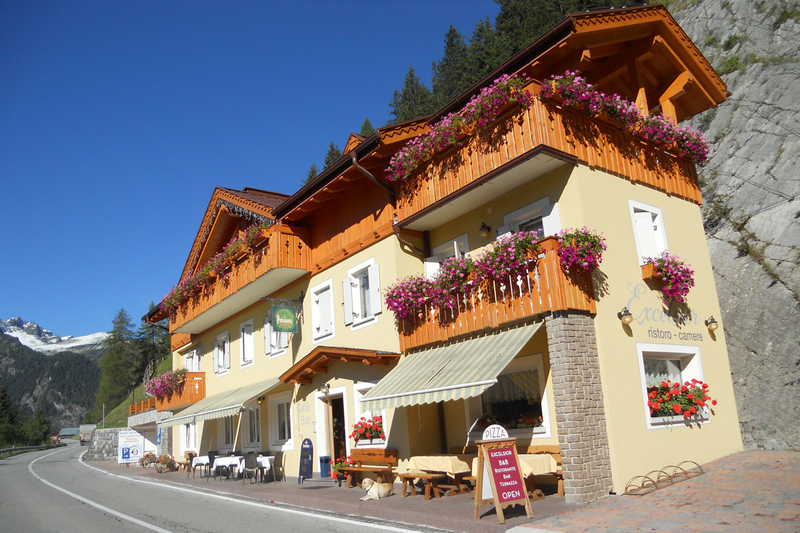 The hotel Alpino situated in Livinallongo Del Col di Lana has been completely renovated and modernised, we have 10 rooms and a splendid double suite. When you enter these rooms you have the sensation of finding yourself in an oasis of relaxation, you only need turn to the window to admire an out of this world panorama. The rooms are found on different floors, the higher you go the better the view of these characteristic cliffs of the Dolomites. Our other strong point is the numerous extra services and the availability of the kind and caring staff who work daily to ensure your every need has been taken into consideration. If you are intending to take a pleasant and relaxing mountain holiday, call us and we will give you whatever information you may need. You may book a room with just bed and breakfast or you may choose to dine at our restaurant where you will find the height of professionalism and warmth to help make you feel at home . Our restaurant in the centre of the village has a splendid enclosed balcony from which you can dine on the typical specialities, at the same time enjoy the beautiful panorama. 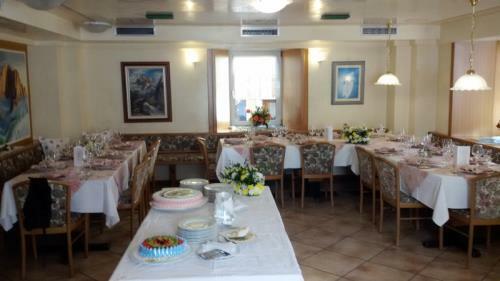 If you remain here for a few days the staff will guide you through a range of different dishes ready to order, it will be a real gastronomic highlight to savour the typical cuisine from the Belluno province. Everything prepared and readied under the watchful eye of the proprietor. The philosophy of the kitchen at Hotel Alpino’s restaurant is based around some fundamental points that illustrate the local history, traditions and cuisine from the area. First of all the products must be fresh and of the finest quality, for this reason we propose a menu that uses local produce and where possible goods from our own vegetable garden. The second but not less important detail is our dedication to every particular aesthetic aspect to ensure our dining room has a decorative ambiance during your stay with us. Upon entering the hotel you will find a separate bar ,always open and ready for you to enjoy the best aperitifs and typical local “grappas” In the morning a nourishing and nutritious breakfast awaits, either sweet or savoury to satisfy every taste, Italians and foreigners alike. Our restaurant is not only open for dinner but also for lunch, therefore our clients can choose to use the half or full board service. Or you could enjoy the a-la-carte menu selecting typical and traditional dishes. If you are snow skiing you don’t need to move your car, we offer our own minivan service to transport you directly to the ski carousel “Sellaronda”. Hotel Alpino also offers our guests the opportunity to enjoy a comfortable transfer taxi service to the airports, train stations and big cities. The hotel can organise as necessary long or short trips giving our guests the chance to undertake interesting excursions in the territory to assist them comprehend the natural attraction of the beautiful and particular Dolomites in our area. The comfortable rooms are furnished with bathroom/shower, direct call telephone, satellite television and free Wi-Fi connection. 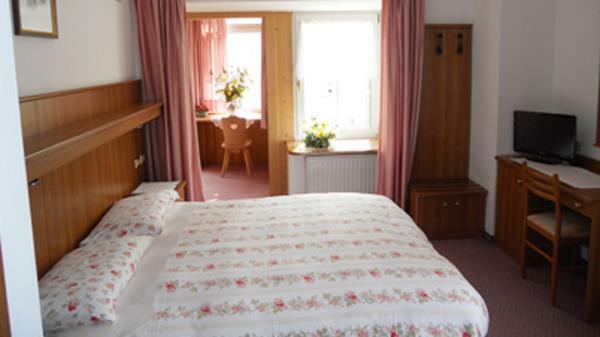 You will be truly welcome at our B and B Excelsior, it has recently been renovated and consists of six well equipped and furnished rooms with every attention to detail. The building has a bar and dining room incorporated to serve breakfast and a beautiful little external terrace, a place to rest and enjoy the panorama. We give our guests the option to use a half board service by accompanying them to dinner at our restaurant at Hotel Alpino. The distance between Excelsior and Hotel Alpino is one and a half kilometres. The staff at Excelsior will be pleased to welcome you and answer all of your questions. Our bed and breakfast is the perfect place to stay if you are looking for a tranquil setting in either summer or winter.